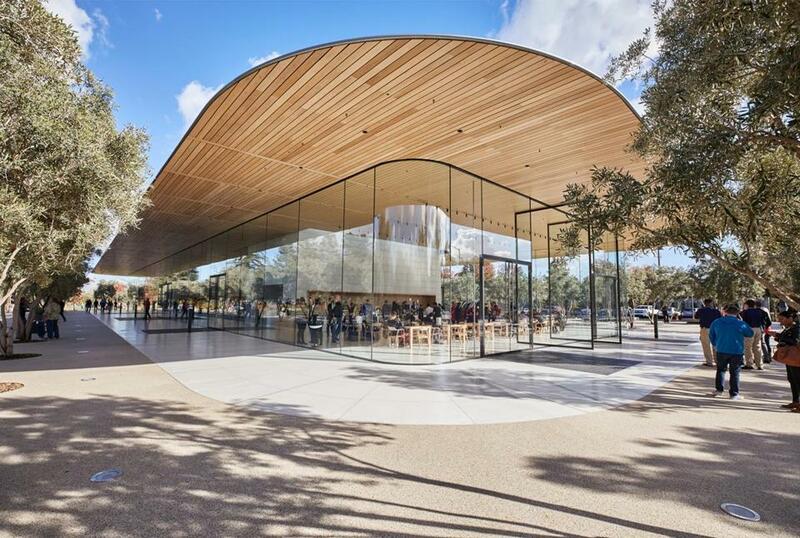 Apple has opened a $108 million visitor center at its headquarters in Cupertino, Calif.
PALO ALTO, Calif. — It’s an odd place for a pilgrimage: a quiet suburban street of low-rise shingle-style houses near the Stanford University campus. But the GPS on their phones leads a steady stream of tourists from around the world to 367 Addison Ave.
What they’ve come to see is even more surprising: a singularly plain wooden 12-by-18-foot one-car garage. It was here, in 1938, that Bill Hewlett and Dave Packard built an audio oscillator, the first creation of the company that would ultimately bear their names. And that has made this unassuming structure, with its barn-style green door, into not only a national historic landmark, but a planetary shrine: the birthplace of Silicon Valley. Just as people have long traveled to sample foreign food or see art or historical relics, they’ve begun to journey to attractions that connect them to a much more recent era: the technological one. Once only grudgingly tolerated, technology tourism has slowly come to be embraced by the behemoth companies that drive it. Hewlett-Packard helped restore the garage. Apple just opened a $108 million visitor center at its headquarters in (as everyone knows who ever checks the time or weather) Cupertino, Calif. Google HQ has a gift shop; Facebook, a kitschy selfie sign on its Silicon Valley campus, with its “like” symbol. There’s a months-long waiting list for tours of the new Amazon headquarters in Seattle. “It’s definitely a thing. The tech tours of Silicon Valley are incessant,” said Tim Ritchie, president and CEO of the Tech Museum of Innovation in downtown San Jose. This has led to an entire industry that caters to technology tourists. The San Jose tourism agency produces a brochure of Silicon Valley tech attractions, including not only the Hewlett Packard garage but the garages where Larry Page and Sergey Brin cofounded Google (232 Santa Margarita Ave. in Menlo Park) and Steve Jobs and Steve Wozniak worked on the first Apple computer (2066 Crist Ave., Los Altos). 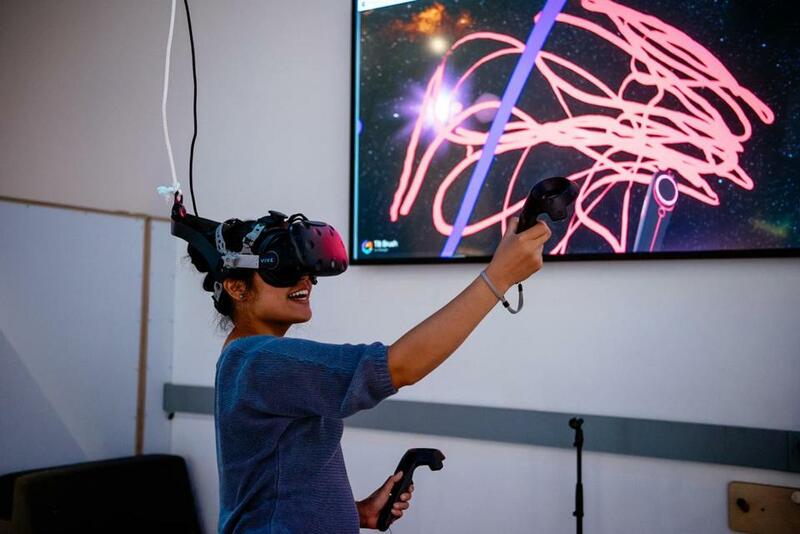 A student uses equipment in the Reboot Reality lab at The Tech Museum of Innovation. Facebook’s Frank Gehry-designed HQ in Menlo Park is also closed to the public, but its thumbs-up sign is constantly crowded with tourists taking selfies. A four-digit semaphore at the top of Adobe’s Almaden Tower building in San Jose attracts puzzle fanatics who try to crack the code. Google adds a new sculpture to its Android Statue Garden every time another operating system is developed, and has a company store. Technology is also beginning to get the museum treatment. Silicon Valley visitors can tour the NASA Ames Research Center, the Computer History Museum, and the Intel Museum, a veritable entomological exhibit of bug-like silicon and microchips. At the Tech Museum of Innovation, they can design real robots and play with the newest tech; the solar-paneled building itself is futuristic, with exposed cables, ducts, wires, and wireless repeaters, wide-open spaces, and huge skylights. “The world is full of problems that are just waiting to be solved,” someone has written on a blackboard. The IMAX theater and the overpowering smell of popcorn confirm that the Tech Museum is mostly for children. That’s one of the reasons people come to areas like this, said Christian Lorentzen of the Silicon Valley Innovation Center, which runs tours: to inspire their kids. “The tourists that we see, often they’re with their children getting them excited about robotics, artificial intelligence, and technology,” Lorentzen said. But adults can revisit their childhoods here, too, test-“driving” driverless cars at Tesla or checking out the Beam store — staffed completely by robots. “There are always those technology geeks, the ones who are going to wait on the curb and get the latest thing,” said Sharon Traeger, who also runs tours. Nor are these kinds of experiences confined to Silicon Valley. Other tech hubs have them, too. There are tours available of the National Renewable Energy Lab near Denver, where research is under way into sun, wind, biomass, and other forms of power. Microsoft in Redmond, Wash., has a small museum (and gift shop) in its Building 92, which covers the history of computing in general and the company in particular, and the newest Microsoft video games and other tech, all free to try. A few miles away at Amazon’s ever-expanding downtown campus in Seattle, the Amazon Go store is an attraction in itself; so far the only one of its kind, the cashier-free store uses sensors and machine learning to scan shoppers’ Amazon Go apps when they walk in, and tracks what items they take, putting them in a virtual cart and charging for them later. Amazon’s glass Spheres, which opened in January, are so wildly popular that to take a tour you need to sign up months ahead of time — though a small visitor center is open seven days a week. The “biophilic design” includes some 40,000 plants separating meeting and work spaces. Experiencing cutting-edge technology like that is one of the things luring tourists to these kinds of places. Soon they’ll have entire neighborhoods where they can do it. Sidewalk Labs, owned by Google parent Alphabet, is redeveloping 12 acres of the Toronto lakefront into an area called Quayside, with driverless cars, adaptable spaces, ultramodern public transit, and technology used to monitor energy output, waste disposal, and other services. Popular culture is also helping to propel technology tourism, from HBO’s Silicon Valley to the film The Internship, with their stereotypical portrayals of socially awkward coders and venture capitalists. Tourists line up for lunch at Buck’s of Woodside, where deals were purportedly made for Facebook, Netscape, and PayPal, and for beers at Gourmet Haus Staudt, a German restaurant where an Apple engineer famously (and unintentionally) left behind a prototype of the iPhone 4. “It’s kind of like going to a zoo and looking at a different species of human,” Lorentzen jokes. Among the biggest groups that come here are East Asians, South Asians, and Europeans who make stops in Silicon Valley as essential parts of US road trips, said Ritchie, just minutes after welcoming some visiting Germans to the Tech Museum.